Oh, hi! Yep, we're still here, I promise. Just busy. Work is nuts, the kiddo is rounding the corner on her first birthday (!! ), and cooking at this stage is....funny. It's not over, not by any means: if you open my fridge, you'll see a rather sundry assortment of edibles, including a stuffing that I made because I had the ingredients, some leftover vegetarian chili from an epic batch that fed our family plus three friends who just had babies (! ), a few stray hunks of cheese, some concord grapes that I scored at Whole Foods after the local season was over, sue me, plus a little container of my pear sauce mixed with yogurt, for the babe. As they do. But sometimes, I get an odd hankering for fussing in the kitchen over something fancier and more involve. 1% of those times, I actually go ahead and make it. So it was two weeks ago: I wanted croissants on Friday, and by Sunday brunch, we were eating hot, buttery, flaky croissants that I MADE MYSELF. This is my third attempt to make croissants. The first two times, I followed Chad Robertson's recipe. His croissants are my gold standard: I literally cried tears of happiness the first time I bit into a Tartine Bakery croissant. But those recipes, what is the deal with their editors? The instructions are unclear and often misleading. In the case of the croissants, their flavor was fantastic but they didn't proof enough pre-baking, and they ended up denser than they should be. This third time, I went down a different road, entrusting my pounds of butter in the capable hands of François Payard, at whose now-closed Payard Bistro I had one of my first truly excellent meals in New York. His croissant recipe took me across the finish line. This isn't a shortcut croissant recipe. It's slightly condensed (e.g. two folds at once means less waiting time), but it's also just straightforward and well-written. The dough isn't a hundred parts - no poolish/sourdough/dough here. Just one big mess that becomes two big pans with rows and rows of beautiful croissants. Most of them were plain, the better to cradle some butter and jam at brunch time. But I set aside a couple pieces of dough to recreate this seasonal pastry from Dolcezza, because croissant dough + pureed squash + seeds + cheese is a winner. For those of you reading this and rolling your eyes: I'll post something less fussy next time, I promise. For now, it's off to Barcelona, where I plan to eat all of the things and drink mostly vermouth. CANNOT WAIT. Put yeast into the bowl of a stand mixer fitted with the dough hook. Add 1/2 cup warm water, stir to combine, and let sit for 5-10 minutes, until starting to foam. Add milk, sugar, the 3 tablespoons of melted butter, powdered milk, and salt. Stir to combine. Add flour; mix on low speed until mostly incorporated. Raise speed to medium and mix until a stiff dough forms, about 5 minutes. Transfer dough to work surface and form into a thick square. Wrap in plastic and refrigerate 2 hours. Place remaining butter on a sheet of plastic wrap or wax paper; cover with another sheet. Using a rolling pin, pound and shape butter into a 6-inch square that's 1/2-inch thick. Set aside. Remove dough from refrigerator. Use rolling pin to roll dough into a 16-inch square on a lightly floured work surface. Unwrap butter square, and place butter square on dough square rotated 45 degrees, so its corners line up with the middle point of each side of dough square (the butter should look like a diamond on top of the dough square). Fold dough corners over butter so they meet in the center. Roll dough into a 12″ x 9″ rectangle, and then tri-fold dough like a letter. 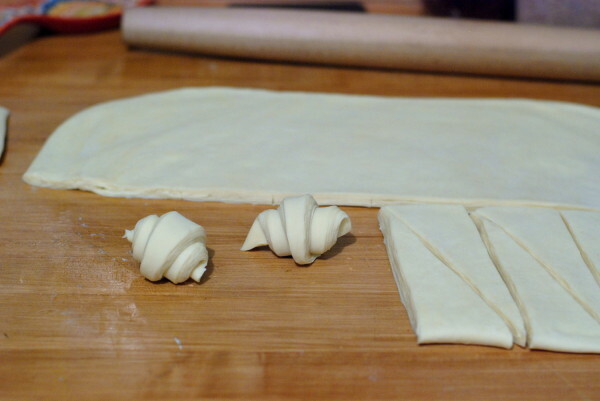 Roll the dough into a 12″ x 9″ rectangle again, and repeat folding. Wrap in plastic wrap; chill for 30 minutes. Repeat rolling and folding dough described above (roll and fold twice each); then chill for 1 hour. Roll dough into a 20″ x 14″ sheet, 1/4-inch thick; halve lengthwise. Cut each half into about 9 triangles, about 3 1/2 inches wide at their base. Roll each triangle from the wide base to the narrow tip, forming a tight roll. Transfer each croissant onto a parchment-lined baking sheet, leaving at least 1 inch between croissants. Let croissants sit until doubled in size, about 2 1/2–3 hours. Heat oven to 375°. Working with one baking sheet at a time, brush croissants with egg wash; bake until deep golden brown, about 20 minutes. Serve immediately.